AC20 Carbon Potential Control. 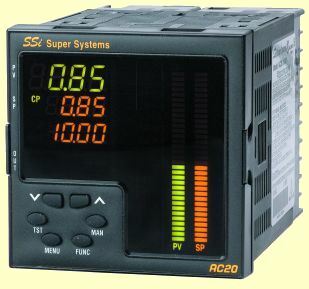 Super Systems, Inc. Programmable Display. Its display which utilizes large dual bar graph and three digital displays, can be programmed to show carbon potential, dewpoint, probe mV, probe temperature and controller percent output. Specifications. Download Complete Specifications in PDF format. Carbon Probe Input. The three analog inputs are used for carbon probe, temperature and percent CO inputs.Available with up to seven control and alarm outputs and up to ten additional event logic outputs. SMART Autotuning PID Control. The AC20 can perform SMART autotuning PID control on an atmosphere furnace’s Carbon Potential, Dewpoint or probe millivolts. Probe Burn Off. Contact input can be used to initiate probe burn off. The AC20 also incorporates three internal timers for complete functionality of the burn off cycle in either continuous or batch style furnaces. These timers reduce panel cost by eliminating the need for three separate standalone timers commonly used in other probe burn off systems. When using a continuous furnace, all three timers are used: burn off interval, burn off duration and recovery duration. When using a batch furnace which uses a door closure contact to initiate the burn off cycle only two timers are used: burn off duration and recovery duration. Contact I/O. The standard instrument comes with three digital inputs. Available with eight additional event inputs. Using the two of three digital inputs, an operator can configure up to four independent setpoints while still using the third input for burn off.